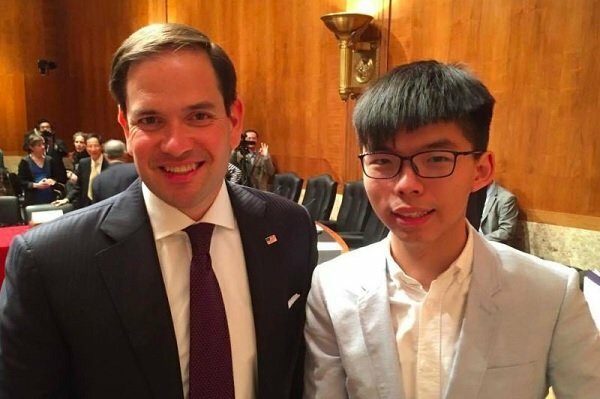 Senator Marco Rubio and Hong Kong democracy activist Joshua Wong (HKFP). The CECC hearing “constitutes a blatant interference in China’s internal affairs including Hong Kong affairs,” said a Chinese foreign ministry spokesman, “The Chinese side is strongly dissatisfied with and firmly opposed to it…. Hong Kong is a special administrative region of China, and Hong Kong affairs fall totally within China’s internal affairs. We are firmly opposed to any country’s interference in Hong Kong affairs in any form. The attempts of some individuals in Hong Kong to collude with foreign forces in meddling with Hong Kong affairs will never succeed” (See South China Morning Post). Such statements on everybody’s “interference in China’s internal affairs” are repeated ad nauseam by the Chinese foreign ministry and state-run media; and could be delivered as effectively from a voice recording, over and over again, as from a live human being. Likewise attacking the activists for “asking foreigners to intervene in local affairs,” China’s state-run Global Times said: “Hong Kong independence advocate Joshua Wong has been condemned as a race traitor after defaming the ‘One Country, Two Systems’ policy in the U.S. and begging for attention from the U.S. government.” Pro-Beijing Hong Kong newspaper Ta Kung Pao also called Wong and Lee “race traitors” and ran an anonymous commentary saying, “It is obvious that Americans are using Wong to attack the ‘One Country, Two Systems’ policy and the [Chinese] central government, but he is happy about his role as a political clown manipulated by others” (See Hong Kong Free Press). The pejorative term “race traitor” (汉奸 or hànjiān), which can also be understood as “traitor to the Han [Chinese] people” or “traitor to the Chinese nation,” is commonly used in nationalistic mainland Chinese circles to refer to Hong Kong democracy activists, to Taiwanese who don’t wish to be “reunified” with mainland China (which includes the vast majority of Taiwanese according to opinion polls), and to anyone else considered disloyal to the mainland Chinese “motherland” and its ruling Chinese Communist Party. Joshua Wong and Martin Lee have both been frequently referred to in nationalistic mainland Chinese news media and social media as hànjiān. Hong Kong has struggled for its democratic rights since the former British colony was handed over to Chinese control in 1997. Under the handover agreement with Britain, China pledged a “high degree of autonomy” for Hong Kong and respect for its democratic rights under the “One Country, Two Systems” arrangement. China has broken these pledges, however, under a systematic program of “mainlandization” aimed at politically and culturally assimilating Hong Kong into mainland China, thereby consolidating mainland control over Hong Kong and preventing “democratic contagion” from Hong Kong seeping into mainland China and challenging authoritarian Chinese Communist Party rule. As a result, human rights and civil liberties in Hong Kong are now at their lowest point since 1997, and “One Country, Two Systems” has been exposed as a lie. Press freedom and freedom of expression in Hong Kong are in decline, and democratic development is stalled due to interference from Beijing. There is now little reason to believe that Beijing ever intended to keep any of its pledges to Hong Kong in the handover agreement with Britain (See Amnesty International, China Post, Freedom House, Human Rights Watch, Reporters Without Borders). 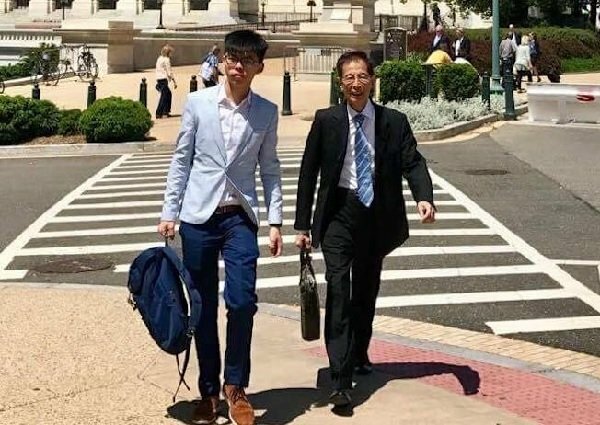 Joshua Wong and Martin Lee in Washington (HKFP). Ellen Bork likewise said: “Beijing has dropped the pretense of respect for Hong Kong’s autonomy and the ‘one country, two systems’ arrangement. The Party is not only preventing Hong Kong from moving forward toward full democracy, it is also advancing communist political culture and taboos within Hong Kong’s society” (See also Lam Wing Kee, Joshua Wong, Joshua Wong and Jeffrey Ngo). Speaking for the United Kingdom by video conference, Chris Patten said that “China is supposed to keep its word to the people of Hong Kong, and Britain has every right to interfere in that.” However, Patten also criticized the UK government for not being “very robust in drawing attention to breaches – whether large or small – in the undertakings of both the letter and spirit [in the agreement] made by China.” Since his departure as Hong Kong’s last British governor in 1997, Patten has been outspoken in his support for democracy in Hong Kong and in his criticism of the UK government for failing to take a stronger stand against China’s violations of the handover agreement.